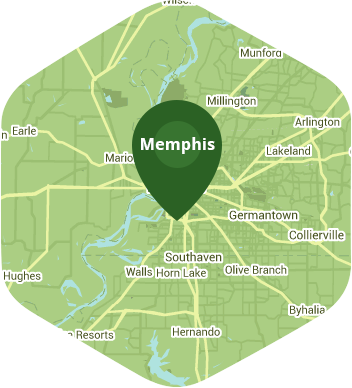 Book a skilled leaf removal expert in Memphis. Backed by a total satisfaction guarantee and amazing customer support. If you are looking for a city that has a rich history and plenty of great music, then you need to look no further than Memphis, TN. There are so many great places to go to in Memphis, such as Graceland, the mansion where Elvis Presley once lived and has now become one of the city's most visited tourist destinations. You can also experience the amazing music scene by attending the Beale Street Music Festival which takes place every May. You will always have something to do here, so don't get stuck raking away leaves from your lawn during the weekend because that's what Lawn Love is for. Memphis gets covered in dead leaves every fall just like with most American cities, and this lasts for several weeks a year. The trees located on your property will shed their leaves as well, and these leaves will cover up most of your lawn in less than a week. Unless these leaves get removed the grass on your lawn will become suffocated by them, and this can prevent photosynthesis from happening. Lawn Love's independent leaf removal experts will scout every inch of your yard and ensure that most of the leaves and other debris are removed from it by the time they are done. Give our team a call at 901-410-4492 to ask for a price quote or book our services. However, if you don't feel like using the phone, you can simply get a free two minute quote online instead. This was our first service and I wasn't at home when he arrived. I texted questions about my service and received an IMMEDIATE response. Prompt and courteous and my front lawn looks great! Thanks!!! Rated 4.69 / 5 stars in 1,875 Memphis customer reviews. It looks like the expected precipitation in Memphis is 1.89 inches, which means your lawn got a nice soaking—leave those sprinklers off today. Dusk and dawn are the best times to water your lawn (the sun will rise at 6:25 AM and set at 7:33 PM today in Memphis). Here are some average lawn care prices for homes in Memphis. Average lawn size 5,736 sq. ft.